America’s southernmost metropolis is young at heart, but skilled at shaking, finds Jenny Adams. Miami’s a young town as far as mixology is concerned, not that youth equals naiveté. This seaside metropolis has everything going for it in terms of libations, serious bar talent, access to America’s best citrus, and a love of pushing limits. The Florida Room – a Latin-styled speakeasy opened in 2008 in the Delano Hotel on South Beach, with a fantastic drinks programme manned by John Lermayer. Though it closed a few years ago, Miami’s cocktail scene has blossomed ever since. Today Lermayer has teamed up with Joshua Wagner at the Regent Cocktail Club, Miami’s first and only classic cocktail bar. “The idea was to pay homage to the great hotel bars of London,” he explains. While Gabe Orta, another ex-Florida Room stalwart, and bartender Elad Zvi, opened the Broken Shaker in The Freehand hotel last year. 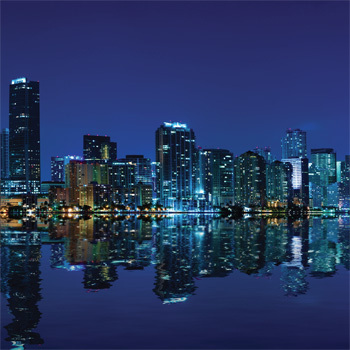 Though largely based around South Beach, the Miami cocktail scene is international in scope and flavour. The Setai boasts Asian fusion-styled drinks and the skills of Phillip Khanderhish, while Laura Cullen has amassed a serious spirits collection at Clarke’s Irish Pub. Yet the bar on everyone’s lips is Blackbird Ordinary with Fraser Hamilton’s boozy slushies and dehydrated spirits. This trend in bars is “something to do with how Miami used to be in the ‘30s and ‘40s, when hotel bars were the thing to do here”, explains Orta. Yet the style of bartending stems from the abundance of juice. What you taste in Miami is fresh. Unbelievably so. That Florida produces almost two-thirds of America’s citrus fruit is one of Miami’s biggest charms for mixologists. While there’s never an excuse to make a Daiquiri with bottled lime juice, here it’s practically a capital offence. And we’re not just talking lemons and limes. At his bar, Russel uses mamey sapot, a Central American fruit that lends a bit of sweet potato and pumpkin to the mix. At The Setai, citrus crops up in Phillip Khanderhish’s homemade shrubs, sodas, sours and fizzes including his most popular cocktail – the Rhubarb Stringer. The Miami bar scene is abuzz with new drinks, new cocktail programmes and new venues. According to Orta, Swine, PB Steakhouse and Khong are the new openings to watch in 2013. “Even though downtown and Wynwood are the most up-andcoming neighbourhoods and, in my opinion, are the future of Miami’s drinking scene, South Beach is still the best place to find cocktails for the moment,” he says.